The shortest of all of the Invisalign treatment options, Invisalign Express is designed to fix small orthodontic issues in a short amount of time. Five to ten sets of aligner trays are used over approximately three months. Because the treatment time is so short, Invisalign Express only treats minor issues, such as two or three crooked teeth or very minor crowding in one location of your mouth. This system can be a great way to reposition teeth that have shifted slightly since you had braces as a teen, or to straighten a couple teeth before a big event, like a wedding or high school reunion. The process and materials used are the same as Invisalign Full and Lite, but the cost is less because fewer trays are used and fewer follow-up appointments are needed. 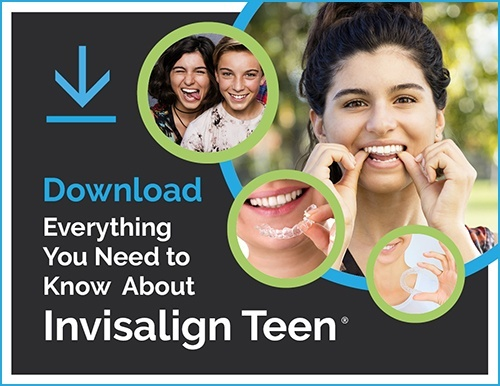 Note: Many people think since Invisalign Express doesn’t take much time and the movement occurring is minimal, they won’t have to wear a retainer. This is incorrect. In fact, wearing a retainer is even more important with this system because the shorter timeframe doesn’t allow for the roots of your teeth to move like they do with longer Invisalign treatments or braces.